There are hot dogs, and there are beef franks. Both are fine, but there are differences. Hot dogs are made of a wild assortment of … stuff, from pork and chicken, to salt, preservatives, and other things. Beef franks also contain an assortment of ingredients, but they are fewer in number, and beef — rather than pork and chicken — is the base ingredient. The net effect of this is that hot dogs and and beef franks have subtle but significant differences in taste. Parkviews — that has a nice ring to it — come in packs of eight and are in the refrigerated section, near their hot dog cousins. Like other beef franks, Parkview Beef Franks can be frozen or thawed, and in our experience the taste tends to be about the same, although cooking from frozen naturally takes a little bit longer. The franks don’t contain any cooking instructions, which is not surprising since beef franks are generally pre-cooked. I don’t think anyone would argue against the idea that the very best way to cook a beef frank is over a grill, although those without grills can also boil them in hot water or microwave them if necessity dictates. Regardless of the method, the franks cook up in minutes. And the Parkview Beef Franks are good. They are every bit the equal of their ballpark counterparts, with a great taste and texture. Pair these with nachos and cheese or Aldi steak fries and you’ve got a tremendously tasty — if not entirely healthy — meal. Any drawbacks? Just one. The Parkviews run about $2.30 a pack at our local store. That’s a lot more than Aldi hot dogs, which can be had for $0.99 or less. Of course, the tradeoff is a superior taste (and for a lot less than a single actual frank at the ballpark), but if you’re cooking for a huge crowd you might think twice about buying a ton of these. On the other hand, if you’re trying to impress said crowd: go for it. They won’t know what hit them. Aldi has delivered the goods on a true ballpark frank here. They cook easily, taste awesome, and cost a lot less than what you’d pay at a real baseball game. If you don’t mind spending more than you would on an Aldi hot dog, this one is a winner. Highly recommended. As a kid, my uncle (the butcher) told me that the terms hot dog and frankfurter were used interchangeably. So they’re the same. As far as the Parkside franks, well, the skin burns rather than browns. One of the few ‘non natural casing’ franks that doesn’t burn black, is Nathan’s. And you can get an 8 pack of nathan’s franks at Aldi for $2.66, as opposed to over five dollars at the rest of the supermarkets, boy have they been ripping us off. So my recommendation, is Nathans. Still the best supermarket type frankfurter available (Used to be Nedicks, but they’re no longer distributed, also due to being marketed as a premium item instead of the ground up meat that it was). Pity the meat companies and supermarkets like to rip us off so much. If Aldi can sell nathans for half the price that the supermarket chains do, they must be really ripping us off. In fairness, the Parkside franks are tastier than most, and are more like what most Americans refer to as ‘smoked sausage’; so a better option is Aldi’s actual sausage, especially the ones with cheese, for $1.99 for the same size package. Does Joshua work for ALDI, why such a contrast in reviews? I don’t work for Aldi and we are not affiliated with them in any way. We spend time with products (which we buy with our own money) and write our thoughts on it. We’ve had Parkview Beef Franks many times, and this review reflects what we’ve found. But I also know that people may have different experiences, and that’s why we have a comments section, so other people can chime in one way or another. On that note, if you have a different opinion, we’re always interested to hear it. I tried these and didn’t really care fore them. I really like Nathan’s hot dogs. They had Nathan’s for only $.79 more so I wish I got those. I just didn’t care for the flavor and texture of the parkview beef dogs. They had a sort of vienna sausage vibe going. WHERE CAN I GET THE JUMBO BEEF PARKVIEW HOTDOGS? ALSO HOW ABOUT THE CLANCEY LIGHTLY SALTED WAVY CHIPS? They are way too salty! Returning them! We purchased these hot dogs a couple days ago. They have been in the fridge and haven’t been opened yet. A roommate went to get one today and the bag was swollen. It seemed like there was more and more swelling over the time. The liquid in the bag looks weird. I researched this brand and found out there was metal in them just last year. I’m going to take them into the store. Best tasting hot dogs ever and my husband is an expert. The texture, taste, and natural “uncured” ingredients make the difference. I don’t particularly like hot dogs, however this brand is in a league of its own for quality. I used to purchase Omaha Steaks dogs, but no more. Thanks Parkview! 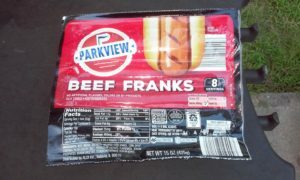 I have been buying the Parkview Beef Franks rather than just Hot Dogs for several years. The increase in price over the Hot Dogs is worth the quality improvement. For the past 6 months, I have been buying the Parkview Uncured Beef Franks which is a step above in quality. However, for the past month or so, I have not seen the “Uncured” Parkview Beef Franks in any of the 3 ALDI stores in the area I have been shopping. Has ALDI dropped this particular item ? Does any one know where Parkview Uncured Beef Franks are sold ?